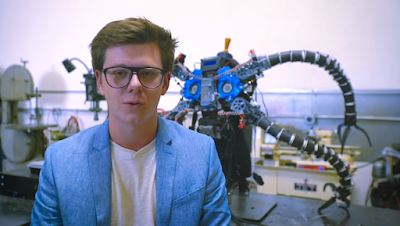 Current World Daily: Tech Entrepreneur Erik Finman builds a real Dr. Octopus suit for a kid with mobility issues. Tech Entrepreneur Erik Finman, has chosen to use his resources for good. Finman, a man Time called one of the most influential teens of 2014, builds a real Dr. Octopus suit for a kid with mobility issues. "I was super into robotics growing up. Got my first kit when I was 3. Loved it! But when I went to school I had all these terrible experiences. Teachers were incredibly cruel to me. Made fun of me for being so deeply into robotics. I dropped out of HS and worked on a lot of cool projects. Made some money. And I found this kid, Aristou, whose Dad is a family friend. He said it would be his dream to build a real life Dr Octopus because of his own situation. He’s an incredibly smart kid, next Albert Einstein, and I saw a kindred spirit. So I wanted to help because no one helped me growing up. It’s Important to encourage this type of thinking at a young age. So I decided to use my robotics expertise, get a rag tag team of engineers together, and build a real life Dr. Octopus suit." "Yeah, I’m thinking about it. Currently deciding. With just another 20K in improvements we can get it to lift a car. We’ve done the math. But it’s just a hobby for now. A lot of investors have reached out wanting me to start a business off of it. But right now I’m really focused on education. It’s my number one interest and problem to solve. So unless an investor writes me a huge check to turn [robotics] into more than a hobby. It’ll probably remain that way for now. I’m dedicating every cent I have to working on a new education project. But when that’s going smoothly I’ll turn my attention back to robotics. I want to make a real life Iron Man suit next!"